The Worlds Longest Lasting Nitric Oxide Pump! 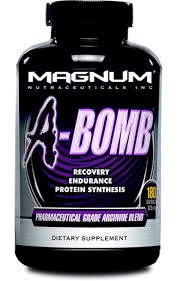 Magnum A-Bomb is an Arginine blend that assists with muscle recovery, endurance and protein synthesis. With every ingredient being Pharmaceutical Grade, Magnum A-Bomb offers five potent, bioavailable sources of Arginine, L-Citrulline to complement the Arginine, and two antioxidants to assist in free radical clean-up. Arginine is a semi essential amino acid that is a building block of protein. Arginine is not manufactured endogenously, and exogenous consumption is required to satisfy Arginine requirements. Arginine is known best for the “pumps” it creates and is recognized as an all-natural way of increasing strength, growth hormone output, lean muscle mass, and minimizing recovery time.